Named one of "12 landmarks that will change the way you see the world"! The key to the setting of the house is the waterfall over which it is built. 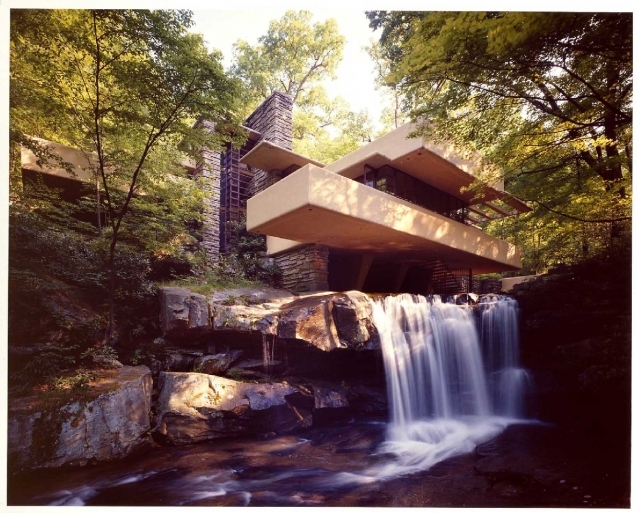 Entrusted to the Western Pennsylvania Conservancy in 1963, Fallingwater is the only remaining great Wright house with its setting, original furnishings and artwork intact. 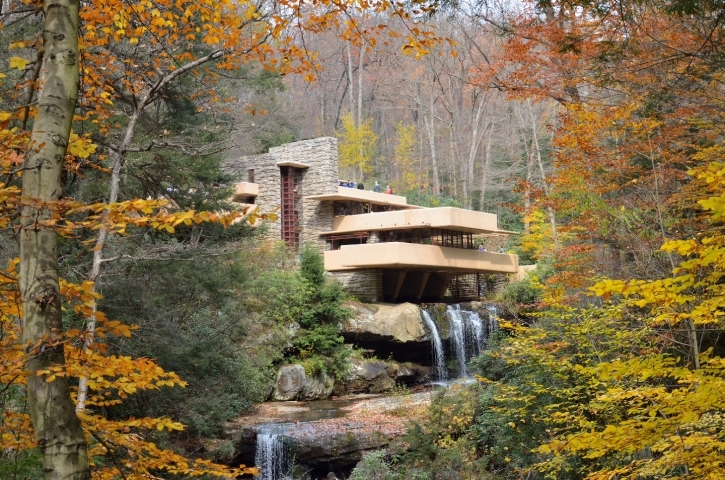 Over four million people have visited Fallingwater since it opened to the public in 1964. Regular one hour tour, self-guided Grounds tour, two hour In-depth tour, Brunch tour and Sunset tour available. Reservation or advance ticket purchase is essential for all tours. During periods of high visitation exact tour times cannot be guaranteed. For a more leisurely, less-crowded tour, we suggest visiting Fallingwater on weekdays. Fallingwater is open daily except Wednesday from 10 a.m. - 4p.m. mid-March through Thanksgiving weekend. Also open December weekends, the week between Christmas and New Years and the first two weekends in March, weather permitting. General Information: Dates Closed: Closed Wednesday, December weekdays and January and February, Hours: Daily except Wednesday, 10 a.m. - 3:30 p. m.
The classic Fallingwater view from the south. Harold Corsini photograph.